This adventure is designed to fit in perfectly with the Kingdom-Building Adventure Path, serving as a great way to introduce the ongoing plots of the master villain of that adventure series, but as a unique intrusion of otherworldly enemies it can easily be transported into any campaign. Featuring a desperate pursuit of mysterious fey both malevolent and benign, in Horns of the Hunted superstar author Matt Goodall has created a dreamlike and otherworldly feel that provides a memorable journey into the dangerous and deadly world of the fey, with beautiful maps by Alyssa Faden and delightfully old-school art by Pete Fairfax. This plug-in module for the Kingmaker AP is 32 pages long, 1 page front cover, 2 pages editorial, 1 page ToC, 1.5 pages of how to use/introduction, 2 pages of advertisement and 1 page back cover, leaving us with 23.5 pages of content, so let's take a look, shall we? This being a review of an adventure-module, potential players are hereby advised to skip to the conclusion to avoid the imminent SPOILERS, which btw. also extend to the Kingmaker-AP to a lesser degree. You have been warned. Still here? All right! Generally, this module is intended to happen at around 6th level, near the end of "Rivers Run Red", i.e. the second Kingmaker module. Bow one of the imho weaker aspects in one of my favorite APs (and many others) is the lack of foreshadowing of the BBEG - and this module addresses this particular gripe via a henchman of Nyrissa, one bound fey warrior named Harakund. His devious plan focuses on acquiring unicorn-horns to allow his mistress control over the Gnarled Forest. Things get more complicated, though - Harakund's entourage contains a forlarren in love with a satyr bard who may yet be saved from damnation. Especially, since the second encounter follows hot on the heels of the first, with fey wolves attacking with rather men wolf tactics. After that, the PCs are on the chase - the hunters have taken one of the unicorns and a cool chase is one - 9 instances await the heart-pounding hunt for the hunters, aligned in an easy-to grasp one-page flow-chart. Neat indeed! There also are two hunting groups to spice up the chase and track via the special dust the PCs received. Aforementioned Forlarren sorceress (awesomely depicted by Pete Fairfax) proves to be the one covering the escape of the hunters -and there is the moonstone key to follow the fey into their lands. Stepping through, whether with the Forlarren defeated or not, the PCs meet an actually rather friendly faun who may prove to be a font of information for the PCs. Among the other forces they meet, there would be a grizzly with functional butterfly wings (who can actually be reasoned with - neat!). It should also be noted that from spring to summer to autumn, this fey realm follows thematically the progress of seasons, with the third season pitting the PCs against giant twigjacks and finally, at the heart of winter, they have to deal with Harakund himself - a dread cold rider, riding a deadly rimefrost goat. This and the penultimate encounter both come with glorious maps, btw. 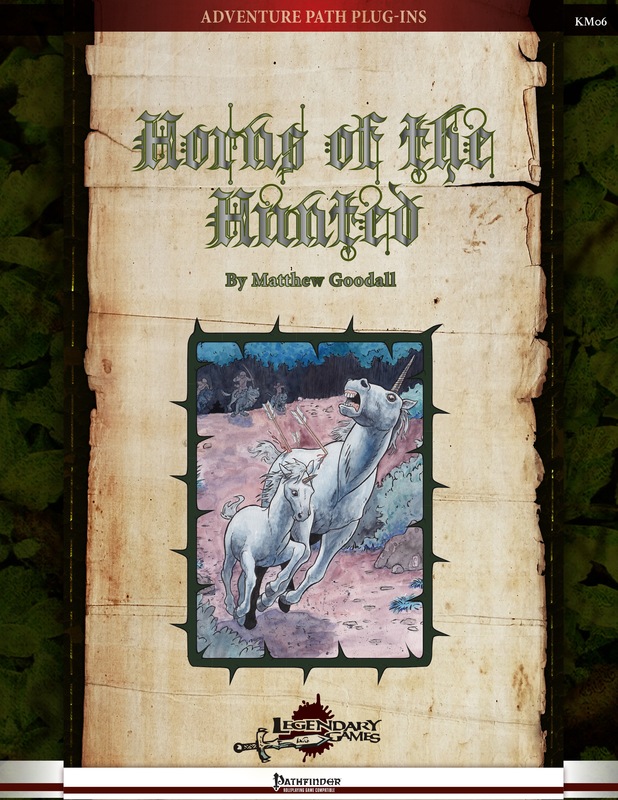 Reward-wise, beyond saving a unicorn, the module offers for cool benefits on the kingdom-ruling context and even offers some synergy-benefits when used with Ultimate Campaign. Neato! Editing and formatting are top-notch, I didn't notice any glitches. Layout adheres to Legendary Games' parchment-style 2-column standard and is full color. The maps by Alyssa Faden are superb, but come sans a player-friendly version without numbers etc., somewhat limiting their usefulness as handouts. The original pieces of full-color artwork herein are interesting - Pete Fairfax utilizes a soft style of pastel-colors that lend a distinct, hand-drawn flair to the module without compromising in quality - And I really like it, since it is very distinct from standard artworks, lending the product a unique sense of identity. The pdf comes fully bookmarked for your convenience. Matthew Goodall has not reinvented the wheel here, but oh boy does this serve its purpose perfectly - lighting up the task of kingdom-ruling at a place where it is imho all but required, this fast-paced action-romp adds a superb change of pace to kingmaker, blending cool action, iconic imagery and a cool planar sojourn while making the actual storyline of the overall AP work better. This module doesn't just have cool encounters, intriguing adversaries and options to actually spare foes and solve encounters without killing everything, it actually makes the overall AP run smoother thematically. So...fun module. Diverse challenges. Improves overall AP. Synergy with Ultimate Campaign/Rulership-rules. If you can't guess by now - "Horns of the Hunted" should be considered a required addition to the Kingmaker-AP, a module that improves the overall experience and well-worth 5 stars + seal of approval. In the latest module from Legendary Games meant for use with their "Kingbreaker" line, your newly-fledged rulers start off with a celebration for their new land, only to have problems when a child finds a slaughtered unicorn. Then it's a plea for help from an old ally and her unicorn friend for assistance against the Furious Hunt and that leads right into a wild battle, followed by a chase that ends up on the very threshold of the world of the Fae -- and then over. And then things get really strange as you get a taste of what the First World can be like as you enter the bizarre Realm of Four Seasons. I really like the latter, as I'd say it 'gets' the feel of the otherworldly Fae and yet at the same time shows their links to nature. The second part of the adventure contains more interaction and social skill use than the more physical and combat-oriented first part as you had to finesse your way past several potent and whimsical Fae guardians. Do well and you may have some aid in the final battle. Do poorly and you end up with even more enemies. It's a very well-done adventure, with a good balance of combat and roleplay, mayhem and skill use in it. Okay the main idea may be a little old school (rescuing a unicorn filly) but it works very well here, and can help explain some of what happened in earlier adventures from the Kingmaker line this is meant to support. It helps to display the Fae enmity that your PCs will probably end up dealing with in the long run as well as serving as a break in an otherwise encounter-a-day and exploration adventure you may be using. Well done and I like how it's handled; five stars. Real happy about this one! I just finished prepping this adventure for play in my Kingmaker campaign. All told it looks like a great time. I love that it was written for six players and that it so effectively foreshadows the Faerie Queens role in the AP. As usual the folks at Legendary Games (& Matt Goodall in particular) have really outdone themselves. After running it as a game session at PaizoCon, I had a little feedback for Matt which he worked into it. Really the key thing I think is to maintain the pace and sense of suspense, and I think the adventure really plays fun. Matt put some great GM notes into the adventure, and I think you'll have a great time with it. Thanks for the tip Jason. I will be sure to keep an eye on their resources to make sure the pace is not too breakneck. I'm hopeful everyone recognizes the lengths to which we go to specifically enhance the play of these various adventure paths with companion products like Horns of the Hunted. It's really the core underpinning of the entire design philosophy to the Adventure Path Plug-In series from how we first envisioned them. The whole team at Legendary Games constantly assesses the public reaction to each AP (as well as each chapter in the APs) to look for ways we can fill a gap or further drive home the story of the campaign. We see it as our purpose as a supportive third party publisher to enhance what Paizo creates. And I think Matt Goodall did an especially good job of that in this adventure. It's a great add-on piece to help you foreshadow the AP's end-game scenario. Many of us have definitely noticed how far above and beyond the Legendary Games Design Team goes to augment the Adventure Paths. I myself eagerly await the new AP Plug-Ins and frequently check both here as well as at Legendary Games site and Facebook page for new announcements. I personally recommend the Plug-Ins to any GM who intends to run Carrion Crown, Jade Regent, Kingmaker or Wrath of the Righteous (or any GM whose game uses the Kingdom Building or Mass Combat rules from Ultimate Campaign). Mine is. And I would not have it any other way. Is your AP Legendary? Mine is. And I would not have it any other way. Ha! That's an awesome endorsement, Weslocke. Jason and Rachel may want to quote you on that last bit as a new marketing catch-phrase. I recognize it and am incredibly appreciative! For GM, and thus players, this particular niche is unbelievably valuable and immediately useful. Keep it up! That would be perfectly fine with me, Neil. Tell them they can quote away. I am off to start Horns of the Hunted for my group. My thoughts are spot on with this. I'm constantly checking if LG has anything new coming up, and I can't praise their attention to detail and customer service enough. They just always seem to know what I'm looking for in a product, and they deliver in spades! Keep up the good work! Thanks for the review, Eric! Posted and linked on our website! Another great review posted up by Endzeitgeist, with very high praise for Horns of the Hunted! In sum, 5 stars plus seal of approval for Horns of the Hunted by Matt Goodall! It's a great addition to a "kingdom-building" AP campaign, but it's easy to drop into ANY campaign where they fey are active. Thanks for the review, Endy! I am in the process of implementing this adventure for my online Roll20 Kingmaker campaign that I run for my friends. I have a small problem: I can't seem to extract any of the maps from the pdf so that I can use them for online campaign. I can take snapshots but those will include any text that are on the map and I like to avoid those because they tend to be "spoilers" for my players. Is there any text-less version of the adventure's maps that I can access (i.e., on Legendary Games's website)?